Apple released Mac OSX Lion on Wednesday, their successor to Snow Leopard. I use a MacBook Air (late 2010) for work and play, so eagerly downloaded the 3 and something GB of new operating system overnight, ready to upgrade on Thursday morning before work. I kicked it off and all was fine and dandy until I noticed two things. One, my Windows 7 VM wouldn’t fire up and I had to reinstall Parallels Desktop, and two, Communicator for Mac wouldn’t work properly. It would sign in ok, but would crash as soon you tried to initiate any kind of session – IM, audio/video, desktop sharing etc. You could open an IM with someone, but as soon as you entered text and pressed enter, it would crash. Thankfully, there’s a fix to this. My only option would have been to use Lync in my Windows 7 VM if I didn’t work it out. The culprit here is the Communicator for Mac 2011 13.1.1 update (that enabled desktop sharing). A simple reinstall of Office for Mac 2011 over the top won’t fix it because the update is still installed. This way, Communicator is completely removed from your system. Now if you do the Office for Mac 2011 reinstall, it’ll install the RTM version (13.0.0), which works fine with OSX Lion. Only problem is you’ll have no desktop sharing. Hopefully we’ll see a patch from Microsoft in the (very) near future to fix this incompatibility up. This entry was posted in Clients, Mac on July 22, 2011 by Justin Morris. You can also restore 13.0.0 from a Time Machine backup (if you have one in December 2010 or earlier), or once you’ve restored the file on one system, just copy the 13.0.0 version of Communicator to your Applications folder on another system, and tell it that yes, you want to replace the newer copy. Both of those have worked for me to back out to 13.0.0 and make Communicator work in Lion. Fantastic, thanks for the alternative workaround Debbie! Thanks Tom, appreciate you providing links to the official word. have you anything heared abour the desktop share problem? On my macbook pro 10.8.1 with Office 2011 installed it still does not work. I had the same issue that OC crashes sending messages but the update fixed that. Still the desktop share problem persists. Interesting, not heard about that. 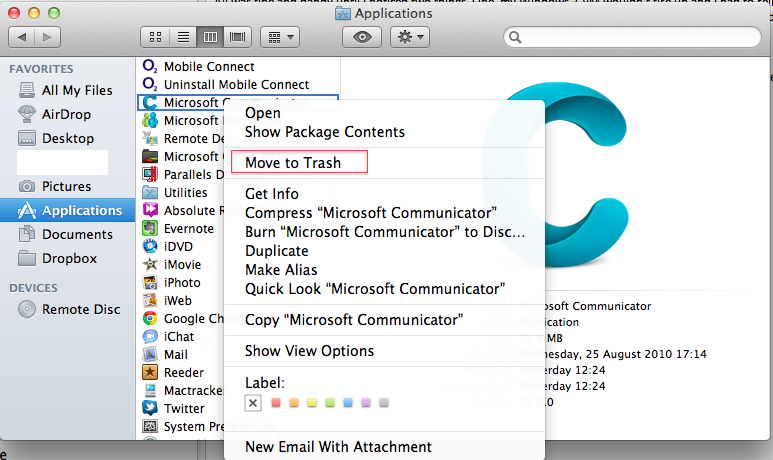 To be honest I’d forgotten about Communicator for Mac once Lync for Mac 2011 came out.